Book Award Winners! Book Awards Winners! Many more will be announced this winter. Be in the know with our handy list below, divided by age groups (Adults, Teens, and Children) for your convenience. 5 categories -- First Novel, Novel, Biography, Poetry and Children's Book - with one of the five winning books selected as the overall Costa Book of the Year. List of 12 audio books in Fiction, Nonfiction, Poetry, and Plays. BONUS: It includes listen-alikes to lead listeners to additional audio experiences. To be eligible, titles must be available for purchase and circulation by libraries. List of 25 very good, very readable, and at times very important Fiction, Nonfiction, and Poetry books for the adult reader. 8 categories -- Adrenaline Titles (Suspense, Thrillers, and Action Adventure), Fantasy, Historical Fiction, Horror, Mystery, Romance, Science Fiction, and Women’s Fiction. 1 audio book is chosen. Bonus: Around this time, the Nebula shortlist is announced! List of 30 titles in outstanding science fiction and fantasy in 6 categories -- Novel, Novella, Novelette, Short Story, Ray Bradbury Award for Outstanding Dramatic Presentation, and Andre Norton Award for Young Adult Science Fiction and Fantasy. 26 categories: basically audiobooks and spoken word entertainment in every genre as well as narrators, excellence in marketing/design/production, and multi-voiced performance. 6 categories -- Autobiography, Biography, Criticism, Fiction, Nonfiction, and Poetry. Five books, five champions, one winner: Canada Reads is a "literary Survivor," with celebrities championing books. Books are voted "off the bookshelf," one each day, until one book is chosen as the title the whole country should read this year. Every March, specific date not yet announced. 41 subject categories (all Adult except for 2 Children, 2 Young Readers and 2 Teens) and best first book for new publisher in Fiction, Nonfiction and Children/Young Adult. 21 categories across Journalism, Books, Drama and Music. 10 categories -- First Fiction, Biography, Autobiographical Prose, Current Interest, Fiction, Graphic Novels/Comics, History, Mystery/Thriller, Poetry, Science & Technology, and Young Adult Literature. 14 categories -- Novel, First Novel, Paperback Original, Fact Crime, Critical/Biographical, Short Story , Juvenile, Young Adult, TV Episode, Robert L. Fish Memorial, Mary Higgins Clark, Grand Master, Raven Awards, and Ellery Queen Award. 1 of the 5 categories is "Children's Book" which can be for ages 0-18. Outstanding titles for teens and young readers who celebrate diversity. Always announced in January. No specific date currently given. 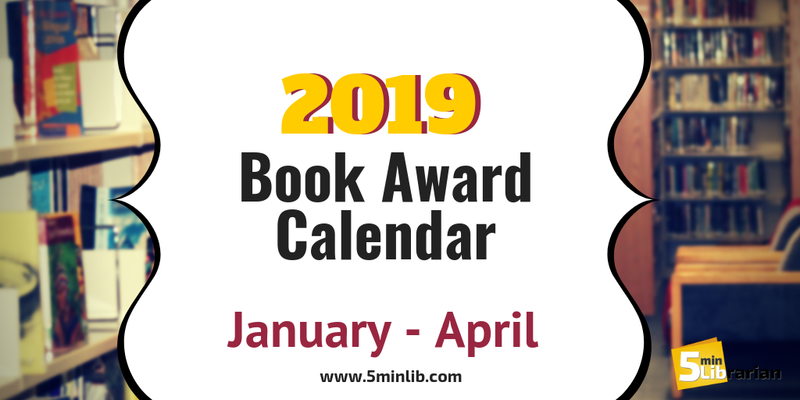 12 categories including Middle-Grade Fiction, Junior/Senior High Non-Fiction, Young Adult Graphic Novels, Young Adult Fiction, and Young Adult Speculative Fiction. 10 categories including one in Young Adult Literature. 14 categories, one of which is Young Adult. 12 categories including Easy Readers and Early Chapter Books, Elementary/Middle Grade Non-Fiction, Elementary/Middle Grade Graphic Novels, Elementary/Middle-Grade Speculative Fiction, Fiction Picture Books and Board Books. 14 categories, one of which is Juvenile. 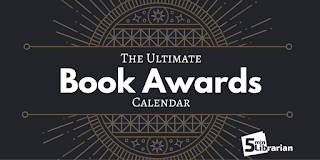 You can find the complete list of awards in our previous post, the Ultimate Book Awards Calendar. The specific dates aren't listed because they change every year, but stay tuned for our next installment (May-August) in April!